Barchart.com subscription web page Click Here. 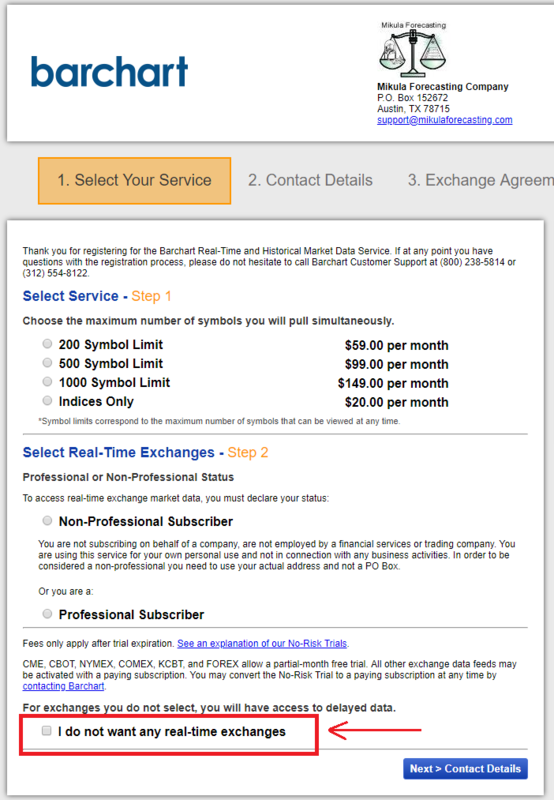 If you are trading End-of-Day you can sign up for Barchart.com and select the check box, ‘I Do Not Want Real-Time Exchanges’ on the order form. This will allow you to access all the historical data and delayed quotes. You can access all the Barchart.com historical data for expired futures contracts back to the 1960s. You also get all the symbols for stocks, penny stocks, futures, index, ETFs, Forex, US Mutual Funds, London stocks, Indian stocks, Australian stocks, international index, international futures and international funds. There are over 50,000 symbols pre listed in MarketWarrior. 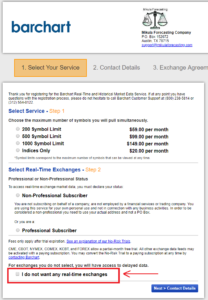 Below shows the Step 1 subscription page.